How would you like to win $1,000 from T-Mobile? And guess what, you don't even have to be a T-Mobile subscriber to enter the sweepstakes. It's all part of the T-Mobile Tuesdays weekly reward program. Besides saying thanks to its customers by offering freebies and discounts (you do have to be a subscriber to earn those rewards), roughly every other week T-Mobile runs a sweepstakes that gives away phones, vacations and other prizes that are open to U.S. residents 13 or older. To get a shot at the money, T-Mobile subscribers can submit up to two entries through the T-Mobile Tuesdays app starting at 5 am EDT Tuesday, April 16th and running through 11:59 pm EDT Sunday, April 21st. Those who are not T-Mobile subscribers can enter the sweepstakes by going to amoe.t-mobiletuesdays.com. A short trailer will play with ten hidden objects. The participant must find two or more objects to receive one entry for the sweepstakes (and when you find two hidden objects, T-Mobile will make a donation to The Nature Conservancy for Earth Day). Another entry can be earned by sharing information about the sweepstakes via Twitter or Facebook. One winner will receive $1,000 plus an additional $428 that can be used for taxes or for anything else that the winner wants to use it for. The total value of the grand prize is $1,428. The ability to purchase reserved tickets to see Ariana Grande in concert from Live Nation. A free taco from Taco Bell. 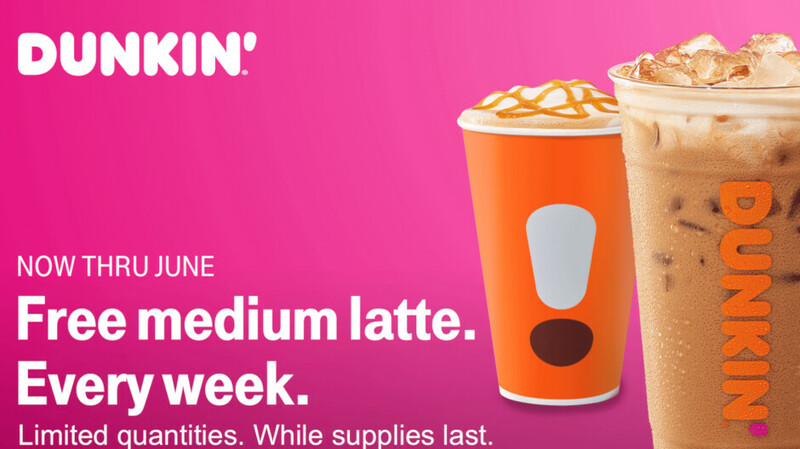 Free medium latte from Dunkin (note the name change); this runs every week through June. 25% off and free shipping from Frank and Oak. 10 cents off each gallon of gas purchased from Shell (up to 20 gallons each week).